Autopilot allows companies to streamline internal processes, from start to finish. Our features are aimed to ensure a better experience for everyone, from your clients to your staff and suppliers. Embed forms directly in your website to streamline processes such as new leads or customer complaints. Use Autopilot's MS Outlook add-in to start workflows without having to leave MS Outlook. Integrate your existing systems with Autopilot using the Autopilot API. Start a workflow by simply forwarding an email to Autopilot. Web based application forms allow external parties to submit applications online. Information request forms allow for the collection of data and documents from external parties such as your clients and suppliers. 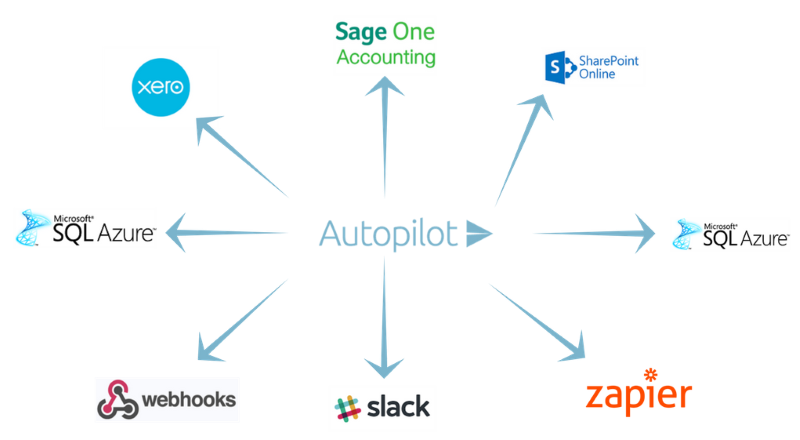 Whether you need to automate the archiving of documents in SharePoint or the creation of invoices in Xero, Autopilot has your integration needs covered. Allow users to approve requests directly from any email client instead of having to wait to return to the office. Keep your finger on the pulse on what is happening at the office by easily monitoring and collaborating on requests. Delegate tasks when you go on leave to ensure business can continue as usual while you are away. No more hunting for files via Recent Documents, piecing together what was discussed from your inbox and trawling through shared folders for supporting policies or assets. Everything related to a request is recorded and referenced in one place. Autopilot specifically brings guidance to the fore and enables you to highlight your process instructions, policies and support channels to help people act with clarity and confidence.